Score available from iTunes and Amazon. I must have watched Napoleon Dynamite and Nacho Libre a dozen times each. So “Jared Hess is looking for a composer for his new film” got me very excited. There’s an old adage in show business that most people have heard. It says “Dying is easy. Comedy is hard.” And it is, but it’s also fun! You have to work to find the line you cannot cross. Can the music be silly, funny, outright humorous? Or does it have to always play straight? Or is there some magic middle ground that cracks the code, so to speak? 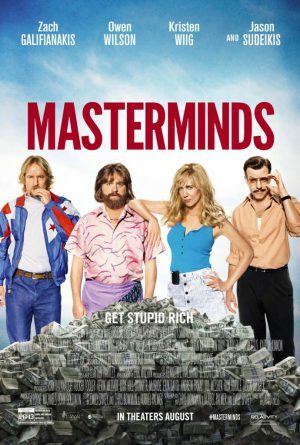 Masterminds, for the most part, plays it straight. Zach Galifianakis, Kristen Wiig, Owen Wilson and Jason Sudeikis don’t need my help to be funny! There are a few tongue-in-cheek moments where the score dips into some Mexican-influenced music but I always tried to approach that from the perspective of David Ghantt’s character. It’s what Ghantt thinks Mexico is like, not necessarily what Mexico is like in reality. In that sense, I finally got to pay homage to the Exotica music of the 1960s like Martin Denny and Esquivel, one of my favorite bizarre genres of music. But I also got to find out what a banjo through an amp sounds like. I got George Doering to play all the guitar parts I couldn’t play myself, and I watched in awe as Steve Aho pounded his drums, miraculously without breaking a single stick.